Is this an easy path for Argentina from herein on? Is the most competitive quarter final fixture Mexico v Chile? Can Peru and Venezuela continue their underdog story? 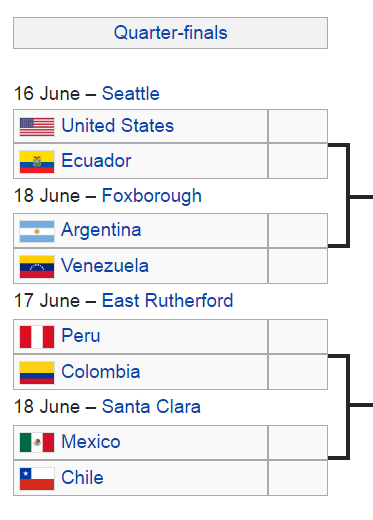 What about the 'lucky' hosts, the USA, who started off on the wrong note but somehow managed to top their group in ridiculous style - especially after Colombia's gaffe?! Well you'd think that Ecuador would put up a good fight, wouldn't you? PS. I hope Wales upset England tonight.